The numbers are in! April 15th's edition of Swing City set a new three year record with 250 people in attendance! Thanks everyone, what a fun night. 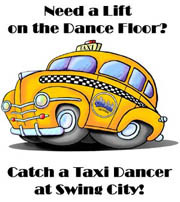 If you haven't been to Swing City in a while, hope to see you because it's hopping for sure these days! This Saturday at Swing City: "Compaq Big Band" at Huron Ave.
One of Swing City's All Time Favortites, Compaq Big Band returns to perform for you this Saturday! 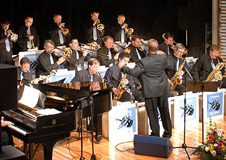 This 20pc classic big band is full of rich sounds and they've played for dancers for over a decade. Expect a full house! JJ Williams will be teaching the beginner class this week, and Mike Jonas (not Stan Yen as noted before, sorry for the error) will be teaching an intermediate class, Balboa this week. Classes begin at 8pm promptly, so be sure to arruve a few minutes early. The intro class will be single step East Coast, while the intermediate class will be taught in triple-step and sometimes will include some Lindy and and other styles. The intermediate class will be different each week. Furthermore, if either lesson is too hard or simple for you, one can just switch to the other one as needed.